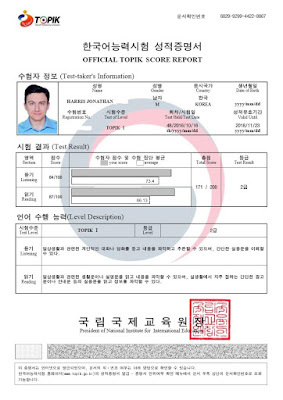 If you're a diligent student of the Korean language, as I once was, there is a test for you to brag to all of your friends how badass your ability is to spin 한국어: the Test Of Proficiency In Korean, more commonly known as the TOPIK. Similar to the TOEFL, it serves the useful function of certifying how skilled you are at listening and reading (and, later, speaking and writing) the Korean language. Or, if you're a little cynical... TOPIK at least assesses how skilled you are at taking a multiple choice test conducted entirely in Korean. "Why wait more than 4 years to do this?" you might ask. Well, since my wife moved to Korea I have considered changing my visa status from E-7, which is something like a "special talent" visa but is tied entirely to my employment status at Samsung. By switching to an F-2 Long Term Residency visa I would be granted a 3-year stay in South Korea and could stay even if I decided to leave Samsung, More importantly, my wife would then also be eligible for the F-2 and would be able to work without needing an employer to sponsor her for a work visa, as her F-3 "companion" visa status does not permit employment. The F-2 visa is a points-based system and people from my background get a lot of the necessary points based on a graduate degree, a high salary, and being in my 30s ... yes, there is age discrimination. To get over the points threshold I saw that I could qualify for F-2 just by passing the "basic" TOPIK I exam. I wouldn't need to be anywhere close to fluency ... which I'm not. In my prime time of studying Korean, the first 18 months I lived here, my teachers were consistently urging me to take TOPIK but I never saw a need – after all my job didn't require Korean and I also didn't see myself working for any other company in South Korea besides Samsung. I figured the Korean obsession with tests was a factor, and also my teachers wanted some validation that I was actually learning. Well, I completely ignored my teachers suggestions to take TOPIK. After leaving Samsung Global Strategy Group in April 2014, where I had 4 hours of free Korean classes per week in the office, my Korean communicating skills have regressed considerably. Shockingly, given the number of foreigners recruited to work in Samsung Electronics, the company does not offer free Korean classes to employees – or at least the Mobile division does not (as officially told to me by HR). I'm given a decent budget for Korean instruction but I quickly discovered I didn't have the energy or motivation to dedicate my limited time outside of work to studying a fiendish language spoken nowhere in the world except the two Koreas (and overseas Samsung subsidiaries). Most of the non-Koreans I worked with share my viewpoint and weren't studying Korean outside of work either. I hired a private tutor to visit Suwon Digital City twice per week, but I found I wasn't getting any better and my seemingly ample study budget was quickly exhausted. I don't really understand how Samsung HR thinks we can function in a Korean-language working environment without giving us a convenient way to learn the language, basically telling us "sink or swim... not our problem". I decided to sign up in August for the October test. For a test with an objective of spreading the motivation to learn Korean around the world, I was expecting a cleaner English website experience. But even signing up for the basic test required navigating forms and a payment system written entirely in 한국어... ugh! 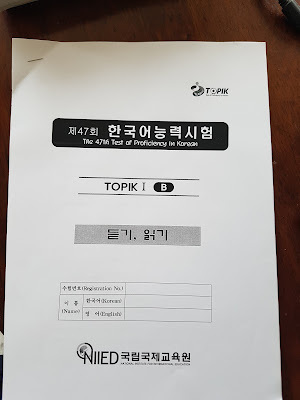 It was basically a Korean proficiency test just to register for the TOPIK exam. But given the awful user experience on most Korean websites I should have expected nothing less. Anyway, enough for my little rant – I was taking TOPIK. The test was in October. So I had two months to prepare. I went to the local bookstore and found a section on Korean language study with some TOPIK study guides. 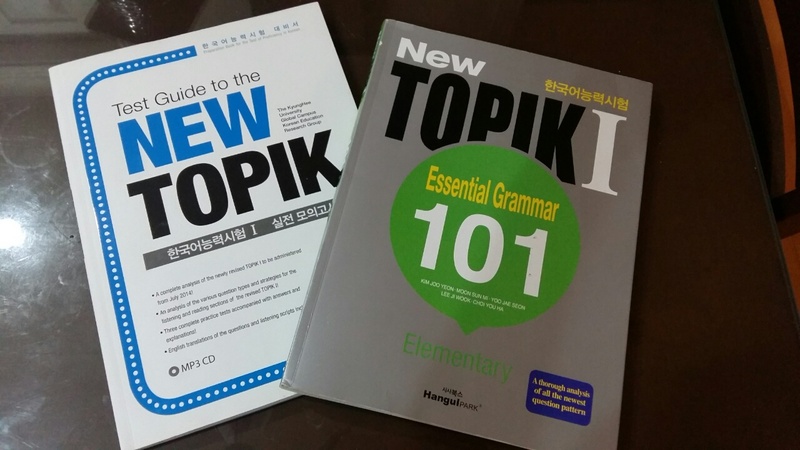 Surprisingly, most of the TOPIK study guides for sale, even for the "basic" TOPIK I were written entirely in Korean. I mean... come on study guide writers... I understand if this is the "advanced" TOPIK II test that I should be able to comprehend a Korean training guide, but for a test on "basic" Korean one shouldn't need to read complex grammar explanations written in a language he can't yet understand! Thankfully I found the only two books in the store which actually had decent English-language explanations – one on TOPIK grammar and one with sample TOPIK questions and answers. I had my self-study books and a handy Android flashcard app that I could use to study words during my long commute time. I even had a little budget saved up from not studying Korean in 1 year to rehire the private tutor to drill me on TOPIK questions. I was taking practice tests on weekends and drifting right around a passing score for the exam. Finally Sunday, October 16 came and I headed to Dongguk University for the 1 hour 40 minute exam, armed with the necessary identification as instructed by the all-Korean text message I received the week of the test. My test-taking place was a dim, windowless classroom. The fellow "basic" test-takers comprised a diverse array of nationalities, ages, and social classes, though I read that the "advanced" TOPIK consists mostly of young Chinese and Japanese students gunning for jobs in Korean companies. We were told that doors closed at 8:30am for a 9:00 exam – strange because we spent most of the downtime just sitting around. Our mobile phones were taken away and I remembered that I hadn't taken a paper exam in the smartphone era – times have changed. We were given our answer sheets and even TOPIK-branded black felt-tip pens which we were told in Korean (I think) were the only approved marking instruments for the test. Other rules were explained in Korean and I dumbly stared at the proctor while pretending to understand. Finally the booklets were handed out and we started – 40 minutes for listening and 60 minutes for reading. Lime my practice tests the beginning questions in both the listening and reading portions were remarkably easy, but after blitzing through those came the passages which separated the novices from the intermediates. I struggled mightily with some questions and patted myself on the back for at least thinking I understood others. Time management was a challenge on the reading section but I managed to get answers for every question – no penalty for guessing incorrectly. I definitely would have scored better in my Korean studying heyday. My ID was checked no less than 3 times, which was a tad distracting. I still haven't received my TOPIK results as it takes 6 weeks to process all those paper Scantron answer sheets, just like the old SAT – but I'm cautiously optimistic that I passed. Having a goal to pass the test was a good motivator to cram on vocabulary and grammar, and I think I could see why my teachers from 3 years ago were pushing me to take the test. Anyway, I doubt I'll dabble in this exam again but I think it was time and energy well-spent... well, I hope so! I received the result and passed the TOPIK I with the 2nd level! I blew away my practice test scores, so I'm glad I took those to motivate me to study harder. I now have a certificate that proves I can read and listen to Korean at the proficiency of a 1st grader!